Just a small video on my rig and the pop up camper. 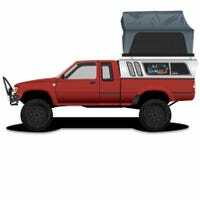 Definitely great for camping and slowly converting this rig to a solid overland vehicle for travels around Texas and the southwest. In a matter of 30 miles, the terrain from McAllen to Rio Grande City changes. It goes from plains to small hills. The caliche rock goes from tan to red. I will say its beautiful out in the western part of the Rio Grande Valley.